According to Paul Brown “The Camp Creek Boys defined southern old-time string band music in their time as Beatles defined rock in 1960’s or Flatt & Scruggs and Bill Monroe embodied bluegrass in the 40’s.” The shoes are mighty big for a band taking the Camp Creek name in the 21st century, but this ensemble fits the bill. 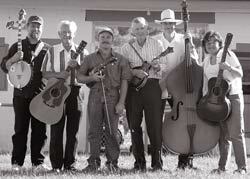 The original Camp Creek Boys included Fred Cockerham (fiddle), Kyle Creed, Ronald Collins (guitar), Paul Sutphin (guitar) and Verlen Clifton (mandolin). The New Camp Creek Boys include two of these original members Verlen Clifton and Kirk’s cousin Paul Sutphin. Both of Verlen and Paul were awarded the North Carolina Heritage award for their contributions to the traditional music of North Carolina. Both men define the unique rhythmic canvas on which the Camp Creek sound is created. They also add some great vocals to the band. Kirk Sutphin (fiddle) was born in 1968, so his first experiences of his uncle’s band were prenatal, but the sounds stuck. 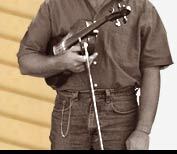 Kirk spent his teenage years with old fiddlers of Round Peak and Galax- Tommy Jarrell, Luther Davis and a later fiddler for the Camp Creek Boys, Ernest East. Tom Mylet (banjo), a native of Philadelphia moved to Grayson County, Virginia in the early 70’s to be closer to the music that he loved. He spent a lot of his 20’s playing music and hanging out in the banjo shop of Kyle Creed. Their time together can be heard in every banjo note from this new ensemble. Lisa Sutphin (guitar), was Raised in the mountains of Floyd County, Virginia, by a predominantly Primitive Baptist family. Surrounded by musical family, Lisa started dancing by the age of two. Nearly every Saturday night of her childhood was spent at a square dance. At a dance later in life she met Kirk and eventually moved to North Carolina where she was fortunate to be surrounded by some of the best guitar players in old time music including Paul Sutphin, Chester McMillian, Doug Rorrer and Bob Carlin. Will McIntyre (bass) learned to play old time music when he was a student at Western Carolina University in the 1970's. His teacher was Eric Olson, folklorist and banjo player with the legendary Fuzzy Mountain String Band. Will has toured internationally, playing bass with Grammy award winning musician David Holt. Will was also a member of the Old Hollow Stringband. For booking information please contact us….